In a criminal case launched several years ago State Police investigates possible negligence committed by officials at Riga Freeport. Previously State Police Economic Crimes Enforcement Department commenced an inspection following conclusions made by State Audit. In summer 2016 State Police concluded that facts uncovered by State Audit warrant a criminal investigation. The criminal process at the time was classified in accordance with Criminal Law’s section on crimes committed in service to state institutions. State Police press representative Ilze Jurēvica reports that the pre-trial investigation continues. The criminal process is initiated in accordance with Part 3 of Section 319 of the Criminal Law – if a public official commits negligence of their duties, which causes serious damages. In the interest of the investigation no detailed comments are provided. This means it is unknown if there are any suspects. As previously reported, Latvia’s State Audit found in an inspection that by outsourcing work normally performed by members of the port’s management, Riga Freeport authority has wasted finances worth at least EUR 611,888. The audit also uncovered additional expenses associated with warehouse construction. In 2009, Riga Freeport authority’s construction project for Krievu Island infrastructure was accepted. Two years later – in 2011 – the construction company was issued a license for the construction of an open-type warehouse on a plot of land located on Zilajā Street. State Audit believes officials of Riga Freeport authority had failed to comply with the duties, and thereby had allowed construction of another legal person’s building that is not associated with the main project. The cost of clearing said territory of the warehouse to make room for the project cost Riga Freeport authority EUR 1,012,467. This means officials’ negligence had caused Riga Freeport considerable damages, according to results of the audit. It is also reported that additional costs appeared for the recovery of loan costs, because in order to afford the relocation of infrastructure to Krievu Island a loan contract was signed with credit institutions for a total loan of EUR 80.2 million. 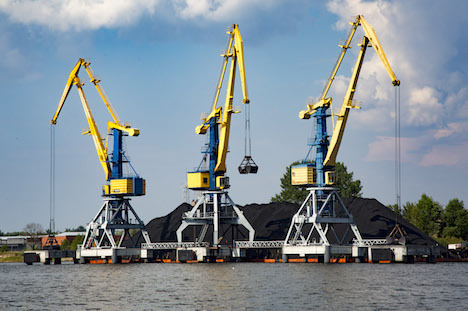 After finding deviations from the project’s goals and failing to receive information from Riga Freeport authority Latvia’s Transport Ministry turned to State Treasury with a request to not perform the already approved payment declaration until Riga Freeport authority has approved a risk assessment plan. The lender then announced halting funding for Riga Freeport authority, adding that members of the freeport’s authority have failed to provide information on the project’s progress. After acquiring information about the project’s progress, the lender reached an agreement with Riga Freeport authority on restoration of financing under the condition that a single-time payment of EUR 120,300 is to be performed to the lender. State Audit believes that by failing to ensure compliance with duties, the port’s authority has created additional costs for the freeport worth EUR 120,300. This is the second criminal process on possible violations committed at Riga Freeport.